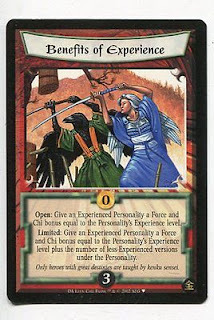 (T)wo sf novels remarkable for their clumsiness and their apparent ignorance of the basic laws of Physics. Hat tip to Pulp Librarian and Miriam Goldstein. Well, I’m sorry, but there are some things that a young kid is just not ready to understand. Differential equations? Quantum mechanics? Tesseracts? There are tons of perfectly fine scientific concepts that are no less legitimate because kids won’t get them. The “Explain it to your grandmother” cliché makes me even grumpier than “Explain it to a child.” Why is “grandmother” become a synonym for “uninformed person”? And it’s always, and I mean always, a “grandmother.” Never a “grandfather” or a “grandparent.” So there’s an assumption that women are the uninformed ones that need to have things explained. I’m 99.9% certain grandma was picked to mean “be RESPECTFUL,” not because she’s old and dumb. An adult with some education, although not an expert. Someone you should treat with respect. Someone whose time is limited and valuable. A prime minister, president, and the like are all people that any scientist should aspire to be able to coherently and concisely explain what they do and why. Justin Kiggins arrived at similar advice to me independently. But while he was being facetious, I am being sincere. Hat tip to Megan Duffy. A while back, I noted that the planned March for Science had gotten a lot of flak, much of which seemed... unhelpful. I want to be clear, though: this is not to say that March for Science should be immune from criticism. I reckon it’s fair to say they are not making everyone feel welcome to the march. They’ve also made other communication missteps, like tweeting outdated news articles and misleading science facts. That said, I have not been following everything the March organizers have been doing or saying super closely (though I’ve collected a lot of links in this post). I think the March for Science is important. It has excited a lot of people, but soured some. I hope that the organizers do better. Sometimes, even reviewer two has a fair point. 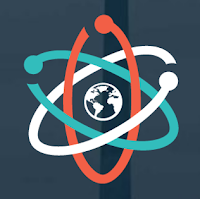 Update and correction, 16 February 2017: The claim that Science March had tweeted out an out of date news article was incorrect (strikethrough above). It may have come from supporter of the March, but not March organizers themselves. The Texas observer has a profile on UTRGV focusing on plans to make the university a bilingual institution. When this has been brought up on campus within faculty, I had heard that there was a law somewhere that said the language of instruction for public universities had to be English. I could not find it, so maybe this was just a rumour. It used to be that the state’s K-12 schools were English only... but that was over 40 years ago. While I’m here, on top of our institution’s issues with accreditation, the nursing program is under warning. It’s only the second round, and I am absolutely hooked on the AFL’s women’s competition. Why am I hooked? Check out the 8 February edition of the Outer Sanctum podcast. Listen to how people flooded out to the first round of games because they recognized it was something historic. Listen to people admitting they were moved to tears, particularly a lot of women who never had a chance to play in a top competitions. Listen to the presenters talk about the diversity in the league, and how different the players’ stories are from the men’s competition: the men footballers had a pretty straight line into professional sports. The women have day jobs of all sorts (one Demons player is a dairy farmer), and many excel at several sports. And what other sporting league – particularly football of any code – would have an openly gay couple playing for two different teams and competing against each other? The bigger, longer running men’s competition has never had a single out gay player, never mind a couple. I am so enthralled that I decided to become club member, even though I will never get to a game in person this year. 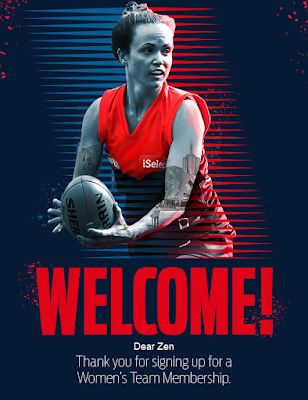 I barracked for the Demons since I lived in Melbourne years ago, and I’m continuing that in the AFLW. Go the Dees! First openly gay AFL player couple: "We're proud, and proud of each other"
For many scientists, there comes a point in their careers where they are not collecting their own data. 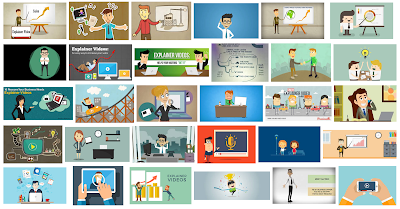 They supervise students, and the students collect the data, leaving the senior scientist (or, to use grant-speak I hate, the principle investigator or “PI”) to write grant proposals and help draft papers. I’m a beleiver that senior scientists should have at least one project of their own. One project where they collecting their own data and write it up themselves as first author. I know that this is overly optimistic, and not a lot of people can do this. But even if you don’t have your own project, it’s still valuable to be in the field or in the lab doing something. I’ve been thinking about this a lot this week. I’ve been spending quite a bit of time in the lab collecting data. I’m quite excited by the small amount of data I have so fa. But the project I’m collecting data for started as an incidental observation last summer. I was helping one of my students on a project, and noticed something interesting. Just happenstance while we were looking at something mostly unrelated. That incidental observation last summer is probably going yield at least one paper. No matter how good and dedicated students are, the likelihood that any of them would have noticed what I noticed, and recognized it as interesting, is low. There are benefits to having experienced observers, and that’s almost always the PI. You transition from lab bench to office desk at your own peril of missing some cool stuff. There have been several “Scientists need to do more outreach!” editorial lately. Some have reminded people that most Americans can’t name a living scientist. The “Do more outreach” editorials got some justified pushback from science Twitter. People listed the many, many things that scientists have been doing for outreach, not least of which was the #ActualLivingScientist hashtag on Twitter. 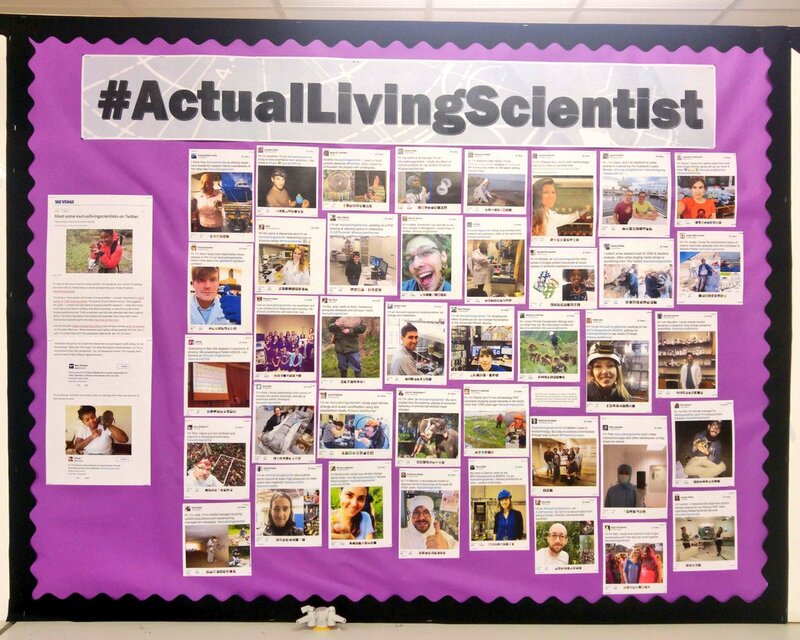 Teachers in K-12 schools started printing out their favourites and stuck them to boards for students to see (above). But while I love this stuff to death, I don’t think that it will make a big dent in the ability of people in polls to name a living scientist. If you were asked in a poll to name a living lawyer, would you name a local attorney whose billboard you pass every day on your commute? If you were asked to name a living football player, would you name your kid’s friend who plays on the high school team? Probably not, because when you are thinking about answering a poll, you tend to think have to think fast. The names that pop to people’s heads are probably people who have some national fame. So no matter how much grassroots stuff scientists do, in a poll, people are still going to answer with names like Bill Nye or Neil Tyson or Bill Gates or Albert Einstein. Who gets to be a scientist? I make a cameo appearance in this Times Higher Education piece that focuses on the US administration threats to stop sending federal money to the University of California, Berkeley if they don’t allow a bigot to speak there. The article wonders if the UC Berkeley story will just be the first in a long series of battles between the current administration and academia. 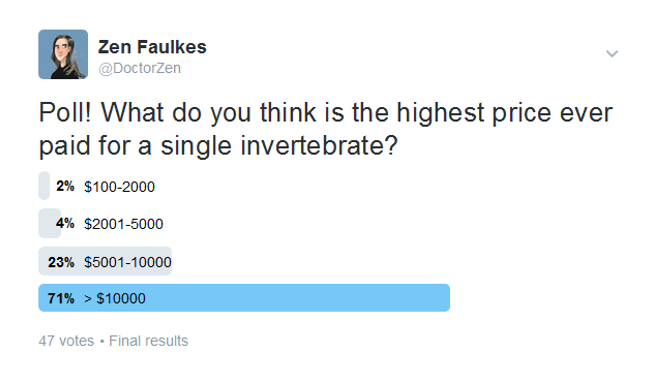 Last week, I polled people on Twitter, asking what people thought was the highest price paid for any invertebrate. 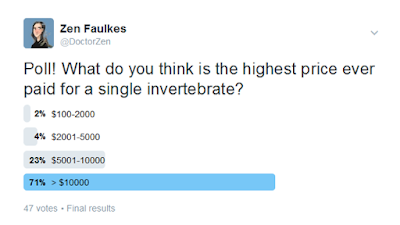 I was surprised that most people guessed over $10,000. * If you had asked me, I could not think of any invertebrate that could command that sort of price tag. I polled because I had read about this crayfish, named “Chao Khun Chang.” It’s an unusual colour morph, but otherwise, it is the ubiquitous Louisiana red swamp crayfish, Procambarus clarkii. It sold for 1 million baht in Thailand, which is in the neighbourhood of US$28,500. 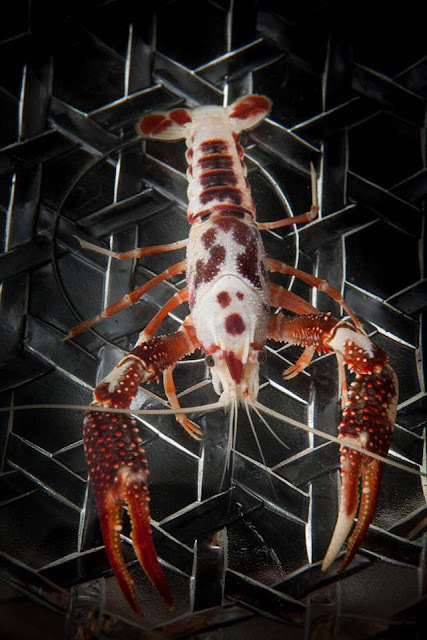 By way of comparison, I’ve been examining the price of crayfish in the North American pet trade for several years now (Faulkes 2013, 2015). The average sale price is $5 to $25 (depending on species). The highest asking price I’ve ever seen for a crayfish was $80, and the highest price paid (including shipping) was $65 (Faulkes 2015). This crayfish is the invert arowana. It’s amazing. Way over $10,000. Paul Ryan doesn’t come cheap. Nope, the best advertisement I saw this weekend was during Round 1 of the inaugural AFL Women’s competition. Powerful and emotional. I amazed by how directly it attacked tropes about the importance of looking a certain way, the double standard faced by women athletes, and about having the ambition to do what you want. Whether or not it was intended, it may be the most overtly feminist ad I’ve seen in a long time. I have been watching the formation the of the women’s competition with interest, and I think this ad crystallized why I think this league is so important. When I lived in Melbourne, I was just so astonished by how much passion for footy was part of the city. It was unavoidable and infectious. That bloke’s game was an integral part of the culture. This is a big cultural change. Imagine being a young girl seeing an ad like this. Suddenly, a dream that you might have had that was impossible – playing professional AFL football – is suddenly possible. And if that is suddenly possible, what other things can you accomplish? Even though my team, the Demons, lost in round 1, this first round has left me anxious to see more. I’m telling you, there are going to be doctoral dissertations about the creation of the AFL Women’s league in years to come. P.S.—There is a website that streams AFL games to locations outside of Australia, WatchAFL.com. There is a free trial period that allows you to try the service until 22 March. This gets you through the regular season for free; the Grand Finale is 25 March 2017. Here is the latest criticism of the March for Science. William Happer, a physicist from Princeton University who met with Mr. Trump before his inauguration and who has been cited as a potential science adviser to the administration (said) that scientists could risk losing some of their public support with a large-scale protest. 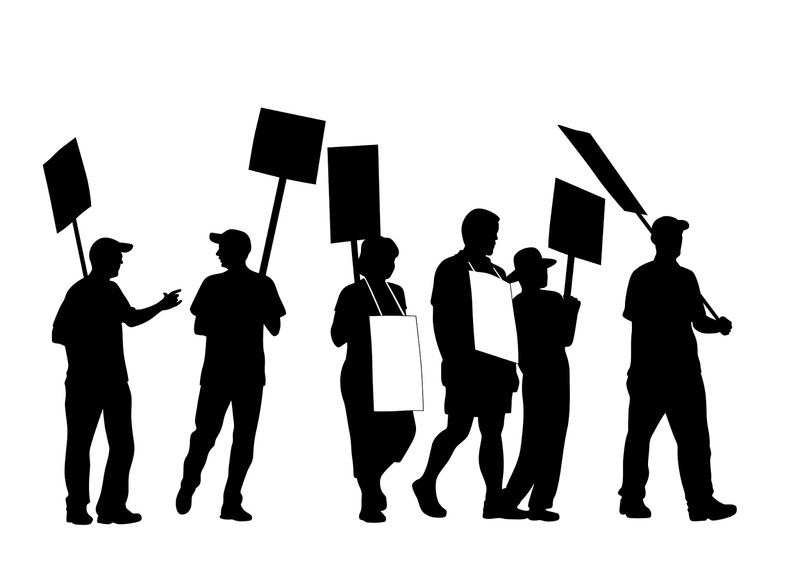 Comparing a peaceful protest for science, by a group that is highly educated and slow to enter the political fray, to a baby’s temper tantrum is insulting. As a potential advisor to the administration, Happer has a vested interest in trying to dissuade scientists from protesting. Between now and 22 April 2017, when the March for Science occurs, many more people will try to tell scientists all the ways that a peaceful protest could (as in maybe, as in might, as in hypothetically if some bizarre circumstances were to occur) make the situation for science worse than it is now. There is unfairness in the world. People, justifiably upset, organize against it. Some people plan public protests about that cause. Others warn that the public protests will hurt the cause, and instead advise people to “work within the system” for change. For instance, Randy Olson asked if a public protest for science was more or less effective than a petition. But the naysayers never seem to be able to point to cases where movements were clearly halted because of protests (possible exception: violent protests), or cases where not having protests yielded demonstrable progress. Petitions rarely make national news or become events that people remember years later. On the other hand, protests often become important cultural touchstones for the communities involved and go down in history. Will a March Help Science? Scientists plan to march on Washington — but where will it get them? You might think as the only person on this campus remotely doing any kind of research related to neuroscience for years (the better part of a decade, I reckon), I might have gotten some sort of heads up about this. I did not. This was a surprise to me. And by the way, there are not multiple “neurosciences.” It’s a single discipline. 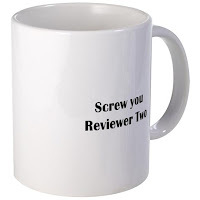 It’s always Reviewer Two who screws you over. 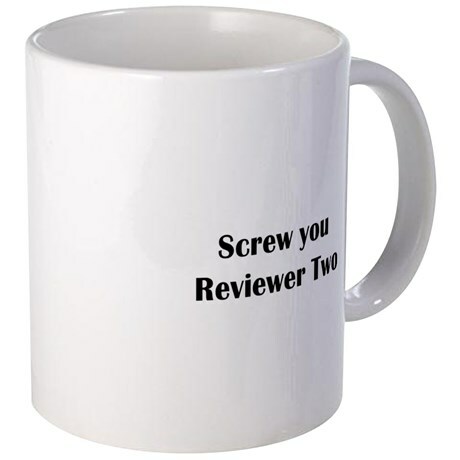 Every academic knows Reviewer Two. This is the person sends back your paper with comments that are not helping. It’s not the experiment they would have done. They think you should do more experiments. They want you to cite these unrelated papers. They just don’t believe the results, even though they can’t or won’t point to a single flaw in the methodology or error in the analysis. Reviewing journal articles was not a big enough venue, so a lot of people want to be Reviewer Two on a planned March for Science. The March for Science is an event planned for 22 April 2017. It emerged a couple of days after the current US administration began, with the gag orders of the Environmental Protection Agency (EPA) and US Department of Agriculture (USDA), with the EPA also having all grant activity frozen. Second reviewers appeared almost instantly. So far, I’ve seen these as the most common complaints about the March for Science. Probably the most widely circulated critique was an editorial in the New York Times by Robert Young. It proves yet again that if you look hard enough, you can find someone with a Ph.D. who will support any position you care to name. 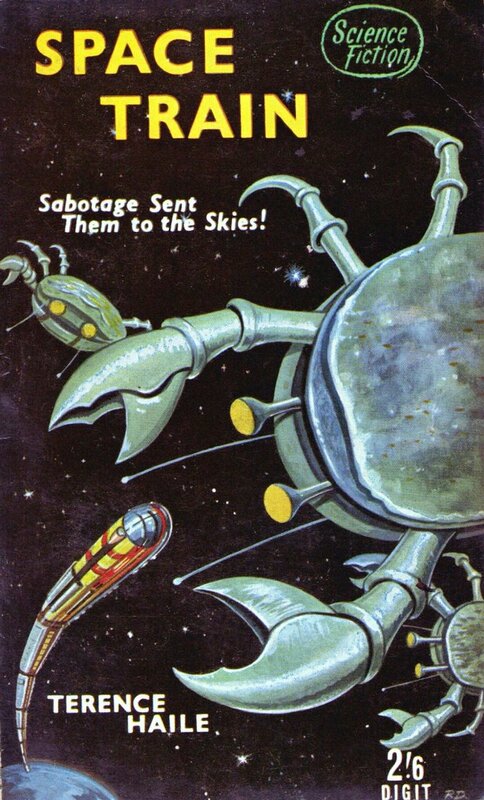 I learned was that most of those attacking our sea-level-rise projections had never met me, nor my co-authors. Not only that, most of the public had never met anyone they considered a scientist. They didn’t understand the careful, painstaking process we followed to reach our peer-reviewed conclusions. Young points out that scientists are invisible, and argues that scientists need to be visible, but does not want scientists to be visible in a march. A march would make scientists more visible than they have been in a long time. There will be media coverage, nationally, guaranteed. Young wants people to play the long game and get involved in local politics. This is important, but there is no reason not to do both. Arguing for “long term outreach and education” is normally a sensible position. But this is not normal. There has never been an American administration with spokespeople proposing “alternative facts” over simple and verifiable information. There has never been an administration threatening to abolish federal science agencies. There has never been an administration complaining about social media accounts for tweeting facts. What’s even weirder about Young’s argument is that he doesn’t even have an anecdote suggesting that this “long game” approach will work. The coastal commission ignored it. The authors, myself included, were widely slandered. And the Legislature passed a law that barred state and local agencies from developing regulations or planning documents anticipating a rise in sea level. Back in 2010 our efforts, along with that of many others, resulted in a ring-fence for the publicly funded science budget – a freeze rather than a cut. The Death of Evidence campaign’s outcomes are maybe a little harder to point to a specific outcome, but it led to formation of Evidence for Democracy. (Interview here.) But in neither case did public demonstrations lead to anything bad happening. When a wrecking ball is swinging towards you, you don’t try to gently nudge it out of the way. This is shaping up as a fight for survival for science in the United States. I do not say this lightly. In The Ridonculous Race (an animated spoof of The Amazing Race), two competitors are “geniuses,” Ellody and Mary. One challenge is to build a sandcastle. The geniuses write a complicated plan in the sand that chews up time and then gets washed away by a wave before they even start their castle. And they are cut from the competition because of it. Scientists are so used to being careful, slow, and critical. This is our strength. It is also our weakness. Addressing every concern of all the second reviewers of March for Science could take scientists out of the race. Are scientists going to march on Washington?